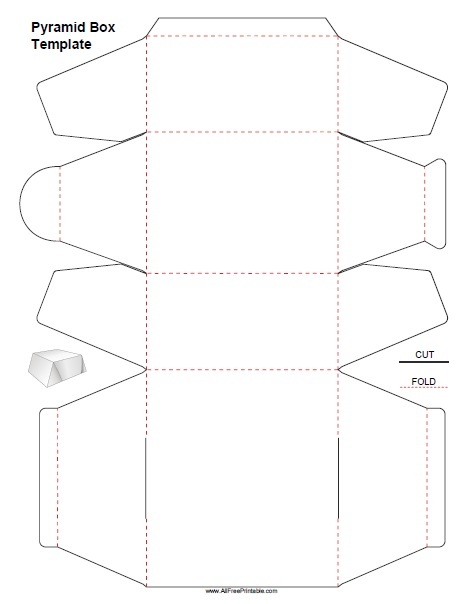 Free Printable Pyramid Box Template. Free Printable Pyramid Box Template that can be great for homemade gift. Great for party favors, gifts for birthdays, Christmas, Easter, Valentines Day. Print this Pyramid Box Template free using your laser or inkjet printer. To make the pyramid box craft you only need a printer, paper, scissors and glue. Just print the template onto a heavy paper, cut using the black lines, fold all dotted lines and glue the flaps to the inside of the box. Use heavy paper or cardstock for best result. One Pyramid Box Template per page. Includes illustration of finished pyramid box. Download or print the Pyramid Box Template free in PDF format.